Water running off a humpback whale fluke during sunset with golden reflections in the wave ripples of the atlantic ocean off the Newfoundland coast, Canada. Every year in summer a bunch of humpback whales, scientifically known as Megaptera novaeangliae, return to Newfoundland waters. For me as a photographer it always was a dream to photograph humpback whales in that area as there is also a chance of icebergs in the region at the same time. Yes, I did get photos of humpback whales with icebergs. It is difficult to stay out long for sunsets in this area because fog can roll in at any time and normally when I photograph whales in that area I only use a fairly small and old fishing boat. This evening we lucked out and the fog took longer then normal. Giving me this unique opportunity to get this fluke shot of a large humpback whale during sunset with golden reflections in the water and wave ripples. 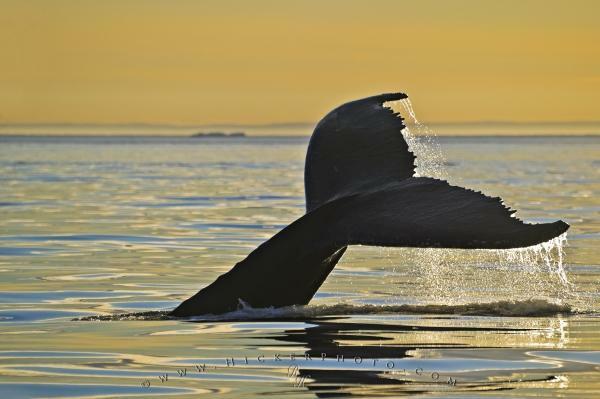 Photo of a humpback whale fluke with golden reflections in the water during a beautiful sunset. ... not only because of the beautiful golden light but also because of the way the humpback whale turned its fluke in the last second to the side, showing the upper part of the fluke too. A great bonus was that the running water caught the golden sunlight at the same time. By the way, I love this photograph so much that we actually have a canvas gallery wrap hanging in our house - it really pops. Humpback whale fluke during sunset with golden water reflections in the waves and ripples, Strait of Belle Isle, Newfoundland Labrador, Canada. I photographed this photo with the digital SLR camera model Canon EOS-1DS, aperture of f/7.1, exposure time of 1/800 sec. on ISO 100, as always I used a original Canon Lens, the focus lenght for this picture was 330mm.